"I hope you die slowly in a pool of pigs blood." "Can I use that towel on your head to wipe my a**"
These are just a couple of the cruel tweets that Laila Alawa, a 24-year-old entrepreneur, has had directed at her in the past week. 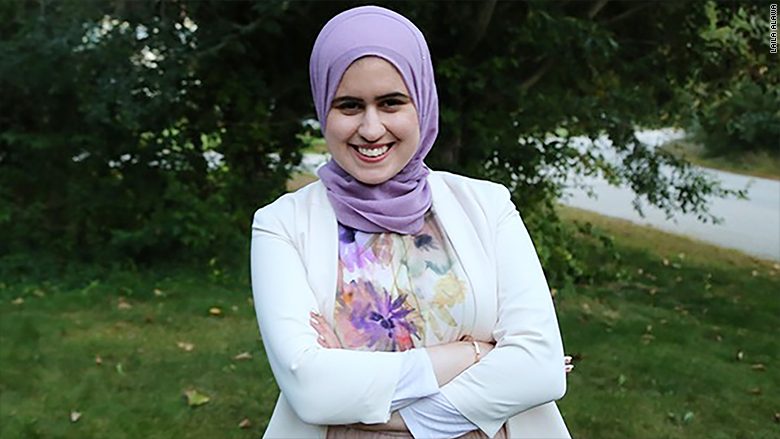 Alawa, who is Muslim, heads up a website called The Tempest that gives voice to millennial women of all ethnic backgrounds. On Tuesday, she woke up to hundreds of "hate tweets." The vitriol hasn't stopped since. Alawa was the subject of an article on conservative website The Daily Caller, titled "Syrian immigrant who said 9/11 'changed the world for good' is a homeland security advisor." It used some of Alawa's tweets to support the claim, including one in which she wrote "9/11 changed the world for good." Alawa explained that she meant "for good" as in "forever" -- not "for the good." The same tweet also read, "I just hope we keep having open conversations about our differences." Alawa, who is Syrian, was born in Denmark and lived in Japan for several years before immigrating to the United States as a child. The story came after the Department of Homeland Security released a report titled Countering Violent Extremism. Alawa was part of a subcommittee that helped brainstorm solutions for the report. She told CNNMoney that the subcommittee met about three times over a six month period and that she spent about 40 hours on it in total. Her name wasn't on the report itself, but her involvement can be found on other documentation online. Alawa told CNNMoney it was "terrifying" to be painted as a "radical Islamic terrorist." The sentiment was echoed in thousands of hateful tweets from online trolls responding to the Daily Caller's article, as well as articles in Breitbart and other blogs. The tweets threaten her life and mock her looks and religion. The Daily Caller's story came out shortly after the massacre at a gay nightclub in Orlando. 49 people were murdered in the country's worst terror attack since 9/11. "I understand that this is a really difficult political climate. People are afraid ... but it is entirely defamatory," said Alawa, who added that the Department of Homeland Security has done little to come to her defense. "Laila Alawa was selected as a subcommittee member because of her perspective as a Syrian American woman of the millennial generation," J. Todd Breasseale, assistant secretary for public affairs at DHS, wrote in an email to CNNMoney. "[She] is not a member of the ... Homeland Security Advisory Council, as has been erroneously reported by some." The Daily Caller stands by its story. "To be clear: Ms. Alawa never served on HSAC itself--only the Subcommittee on Combating Violent Extremism. My piece reflected that distinction," wrote reporter Peter Hasson in an email to CNNMoney. When asked about the backlash, Hasson wrote: "I wholeheartedly condemn any harassment or threats." But the article had no mention of Alawa's work as an entrepreneur or The Tempest's attempts to normalize what it means to be a woman perceived as an "other." "I've grown up as a visible Muslim, with people spitting on me, yelling at me, harassing me," she said. This attention is something she said she didn't expect to result from her involvement with the subcommittee, which she participated in because "if you're not at the table, you're on the table." "This has been really difficult," Alawa said of the online harassment. She said she's reported thousands of the tweets to Twitter and has been in touch with its safety team -- but less than a dozen have been taken down. She said she's also notified the police, who came to her home in Washington, D.C. But the response to online harassment has been less than comforting. "[The police] didn't understand what 'doxxing' meant," she said, referring to a type of harassment where trolls use public platforms to dig up personal information and threaten someone's safety. Alawa said the police failed to understand the gravity of the online threats, which is a frequent critique of law enforcement. "The law is about harassment in the physical world," Ari Ezra Waldman, an associate professor of law at New York Law School, told CNNMoney earlier this year. Law enforcement can see online threats as "just words." Alawa said that her name has been tarnished. If you Google her name, these stories are the first that come up, which she fears could impact her company and its ability to raise funding from investors. Yet she refuses to make her Facebook and Twitter accounts private. "That just shows them that they've won and that they've silenced me," she said. "That would be the ultimate loss for me."